I wanted to share with you some amazing news! We have been working with a renowned, local builder to get more affordable homes to the Niceville area - a huge necessity. Well, I'm proud to say that we have broken ground on a new development - they are paving the road and putting in street curbs as I am typing this. Tidwell Homes is proud to offer for sale 12 single family patio homes starting from the $235's. Carondolet on Avery Drive is located just off 85 South or Government Street. If you are traveling South on Highway 85 and take a Right to travel East on College Boulevard, take your second Right onto Trevor Drive. The street will dead-end at Avery Drive and you will take another Right - this will take you directly into the new subdivision all tucked into a quiet cul-de-sac. There will be 12 patio homes; each will be two-stories, have three bedrooms, consist of a one car garage with an additional side-by-side poured slab, and a fenced-in backyard. The Landen is a 3 bedroom, 2.5 bathroom, 1,668 sq.ft. floor plan with a bonus loft upstairs. 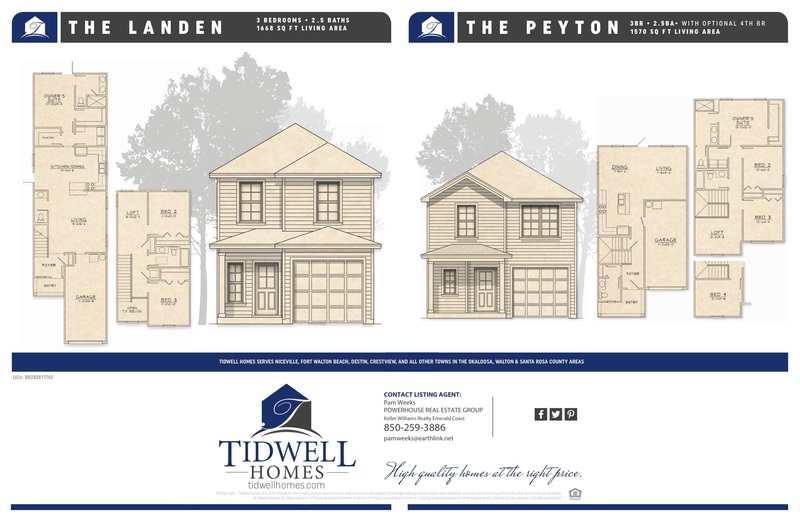 The Peyton is a 3 bedroom, 2.5 bathroom, 1,570 sq.ft. floor plan with an option to convert the bonus loft into a 4th bedroom. Please feel free to click HERE to visit the Facebook page; by liking this page you will get all of the up-to-date information, photos, and availability of this new subdivision. Please feel free to click HERE to visit our website; here you will find more streamlined information, and the opportunity to download the PDF documents of each floor plan available. Let me tell you that this neighborhood is a big local BUZZ. We already have clients that are choosing lots before cement is even being poured. If you are interested, please call us as soon as possible so we can get you into this super affordable neighborhood. We truly look forward to working with you and earning your business.